Frequent itemsets and association rules are defined on the powerset of a set of items and reflect the many-to-many relationships among the items. 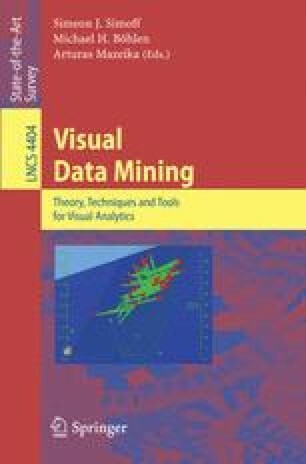 They bring technical challenges to information visualization which in general lacks effective visual technique to describe many-to-many relationships. This paper describes an approach for visualizing frequent itemsets and association rules by a novel use of parallel coordinates. An association rule is visualized by connecting its items, one on each parallel coordinate, with polynomial curves. In the presence of item taxonomy, an item taxonomy tree is displayed as coordinate and can be expanded or shrunk by user interaction. This interaction introduces a border in the generalized itemset lattice, which separates displayable itemsets from non-displayable ones. Only those frequent itemsets on the border are displayed. This approach can be generalized to the visualization of general monotone Boolean functions on lattice structure. Its usefulness is demonstrated through examples.